Are you a Barbie girl, in the normal world? It's a pretty dull place to be, when your head is full of dreams for pink homes, great fashion, and trendy accessories. Alas, there is a way to bring your Barbie World love back into the normal world. And that's by grabbing as many pink items as you can! Sneakers- We all know Barbie loved her shoes. Unfortunately, she usually did it Cinderella-style, because we somehow managed to lose one them. With these sneakers, it's almost as if you found those missing doll shoes. Plus, this counts as wearing heels, right? Makeup Brushes- Barbie wore a lot of makeup over the years. With these brushes, you can have that flawless look too! They’re perfecting for trying out the newest trends. I don't know how well they work, but they sure are pretty! Barbie Necklace- Since nameplates and Barbie were all the rage when I was younger, this seems like the best of both worlds. 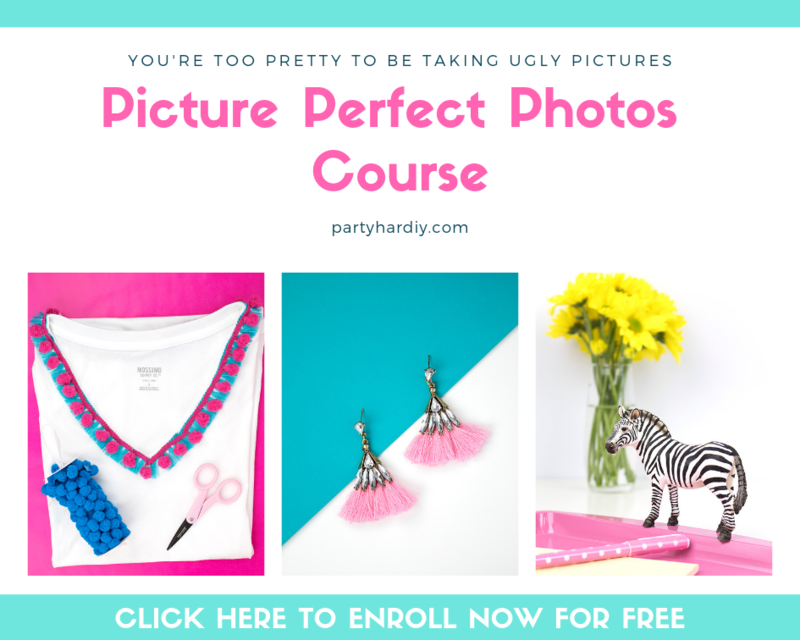 Wear it when you need a pop of color, to show your affiliation with the Barbie brand, or to convince creepy bar guys that your name really is Barbie. Barbie Backpack- A teeny pink Barbie backpack to hold all your cool essentials. I remember the days when tiny backpacks were the “in” thing. They need to make a comeback! We don't need half the things we carry in our oversized purses. Who do I talk to about this?! Pink Sunglasses- These sunglasses are so ridiculous to me because they really remind me of the cheap plastic sunglasses that came with Barbies in the 2000’s, and I love it. I had several pairs of sunglasses with funky colored lenses, and I wore them until they weren’t cool anymore. Ah, the good old days. Barbie Purse- for those of you that aren't willing to embrace the tiny backpack trend, try this purse! It’ll hold all your essentials, and then some. It’s got a girly shape and sporty stripes, so it’ll match with any outfit, plus it adds a pop of color! VW Beatle- I think Barbie cemented our tweenage desire to own a VW beetle. This car was THE car to own back in the days. Now you can commemorate it and enjoy the beetle without, you know, having to drive it everywhere. Lip Stickers- Barbie is known for her iconic pink lips, and now you can be, too! Just place these stickers on everything and everyone you interact with and they'll be sure to remember you. Dog Bone Bowls- What else would your purse pooch eat from? This has one bowl for food, one for water, and one very cute bone-shaped tray to keep your floors clean. Because although Princess is adorable, she’s pretty sloppy sometimes. Pink Glitter- Everything is better when it's covered in pink glitter. That is a fact! Use this pink glitter to add a little sparkle to note cards, tea light holders, and just about anything, really. Dog House- Barbie has had lots of pets in her lifetime, but I imagine her favorite must have been some sort of small puppy. With this, your pampered pooch can have her own Barbie Dream House. Dream car not included. Fling Tumbler- since Barbie is getting married to Ken every few years, I bet she would love this tumbler. She puts the Kardashians to shame with the sheer quantity of weddings she’s had. Oh Barbie… never a bridesmaid, always a bride. Bow Heels- Barbie loves her heels, and so do we! They’re pink and have a bow, which is all you need in my book. Plus they’re Kate Spade! I mean, if Barbie could walk in heels with her disproportionate body, you can too, right? 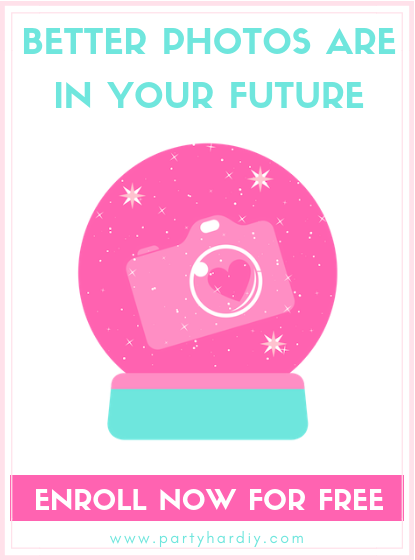 Pink Planner- This planner is perfect for jotting down all your hopes and dreams, like Barbie and her very many career paths. I feel like if Barbie taught us anything it’s that you can have any job you set your mind to, and look damn good doing it! Heart Hangers- These hangers are amazing because they remind me of some doll ones that I had way back in the day. Barbie would clearly hang her clothes on these! It might be a little much to get a whole closet full of these (or not) but I think hanging your party clothes on it would be a perfect use for them. So which one of these items do you like the best? Do you have any items you own that stem from your Barbie collection? Let me know in the comments below! It's a well known fact that everyone's favorite part of Thanksgiving is the food. Seeing your crazy aunt is so worth it when you can have her tasty Mac and cheese. But what's the best part of of Thanksgiving weekend? Besides shopping (and not having to work for 4 days!) it's Friendsgiving. While your grandma is asking when you'll get married, your friends are sharing funny horror stories about the life of a single gal. Or maybe you're spending time together gushing about your friend's new boyfriend. Either way, the pressure is off and you're free to enjoy the food, the drinks and the company. How better to thank your gals for their support than by hosting a glam Friendsgiving dinner? 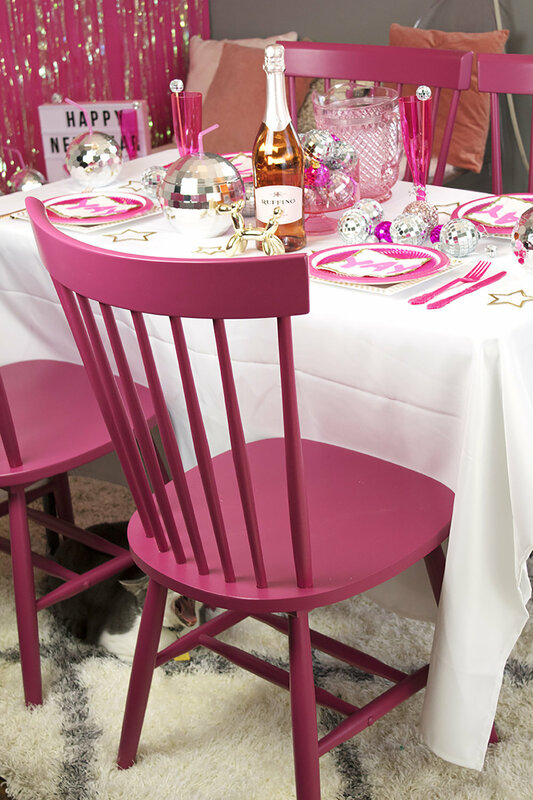 I decked out my dining room with gorgeous golds, pops of pink and orange, and tons of teal. I'll show you how to do it too! Disclaimer- This blog post contains affiliate links. I may receive a small commission if you decide to purchase anything. I only link to items I enjoy or would purchase myself. Since I knew the table decor would be really colorful, I opted for a simple ivory tablecloth to keep it neutral. I added an ivory sequin table runner for a bit of subtle glitz without distracting from all the other decorations. For the centerpiece, I decided to go with the new hot trend, painted pumpkins! While most people like to use real pumpkins, I opted for fake ones. I find that the real ones always get mushy at the bottom, but these fake ones can be used for years to come! All I had to do was spray them with primer, then a few coats of spray paint. One of my favorite parts of this table are these pumpkin candle holders. They come in black, but I think they look so much better spray painted gold! It gives them an elegant touch, don't you think? 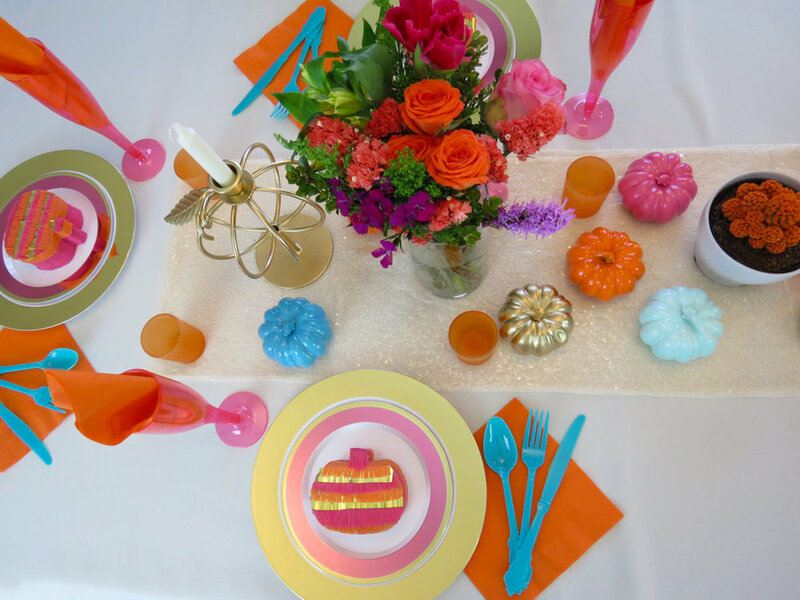 I also scattered some orange votive holders around the table for some extra color and a bit of romance. I added some flowers, because everyone loves flowers. I got mine from the supermarket, and it was already a tiny little bundle! I just trimmed the ends and stuck it right in the vase. It was easy peasy and really dressed up the table. I also found this really cute desert gems cactus at the supermarket, which is a cute and funky alternative to flowers. Fun fact- all the tableware is disposable! This means cleanup will be a breeze, but you don't have to sacrifice style. 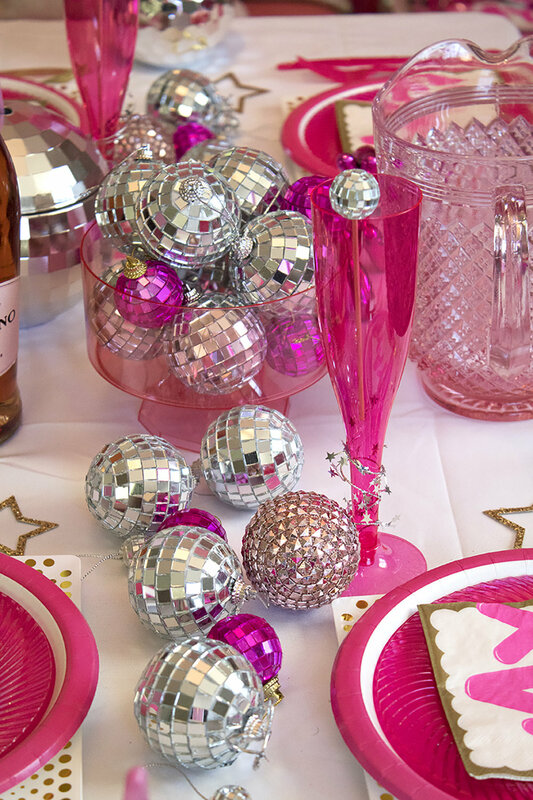 I ran over to my local Party City and picked up these gorgeous gold rim plastic plates, pink and gold plates, and neon pink champagne glasses. They added the perfect pop of color while still keeping it classy. My utensils came from Michaels. They are similar to ordinary disposable utensils, except that they have a really fun handle! The napkins were from Oriental trading as leftovers from my Halloween party. 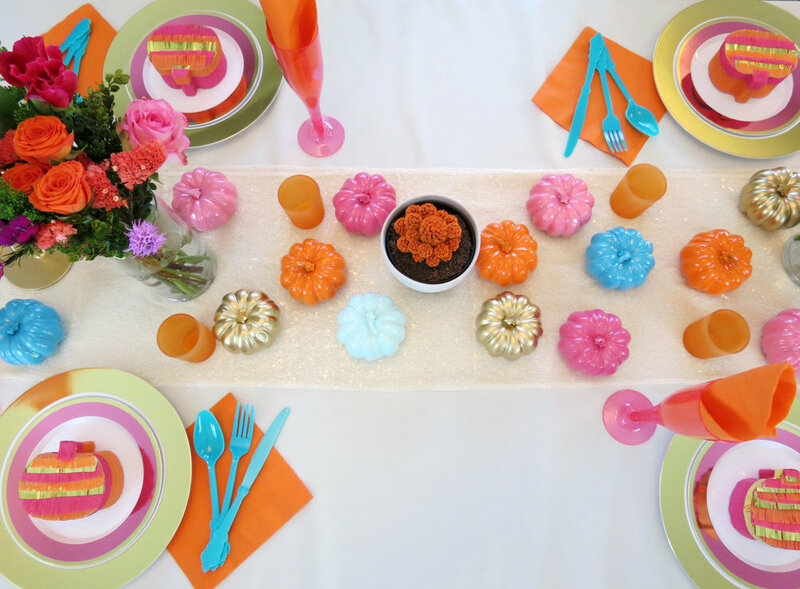 To create the place settings, stack your plates on top of each other and place them in the center of each chair. Take a napkin and place it diagonally with the ridges facing outwards. Stack your utensils on the napkin, placing your spoon first, then your fork and finally your knife. Make sure your knives are all facing the same direction! I created a fan shape to keep it different and interesting. Finally, place your diy mini faux pumpkin piñata in the center. 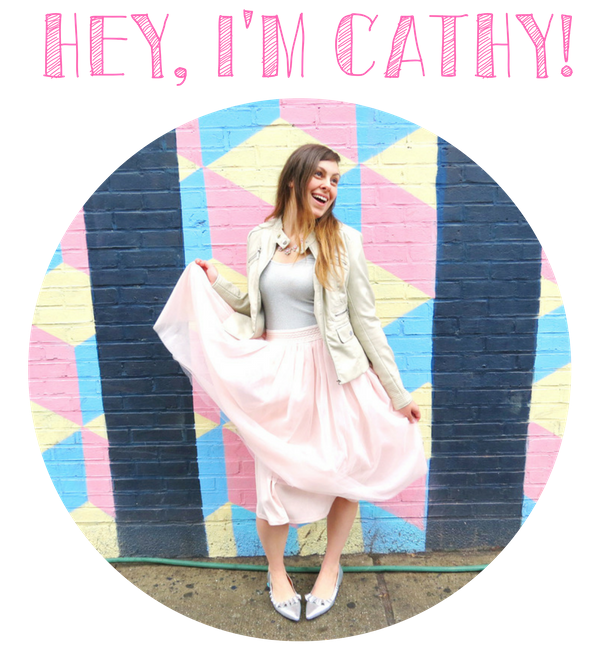 If you want to assign seating, these would be great as place cards too! Just add a strip of paper with each person's name on it. Since your cups will be empty when people arrive, you have to give them a little flair. To do this, I simply folded up an additional napkin to add a pop of color. Everyone can always use an extra napkin, right? 2. Fold in half lengthwise along the straw. 3. Turn the napkin sideways. Fold the corner down towards the bottom along the straw. 4. Flip over and repeat the fold. 5. Take your folded napkin and smooth down the edges. 6. Put the napkins into your glasses with the middle fold facing the back and enjoy! If you've got a bar cart, use it! It's a really simple way to dress up your space and it'll provide some extra room for things like spare cups and drinks. If your home doesn't have room for a bar cart, you've got to check out this folding one. It's cute and sturdy, and packs away easily when not in use! It's the one I use at home and I LOVE IT! Seriously you guys, it's really colorful, strong, and can be used indoors or outdoors. Now that you've pulled your bar cart out, you have to dress it up for the occasion! 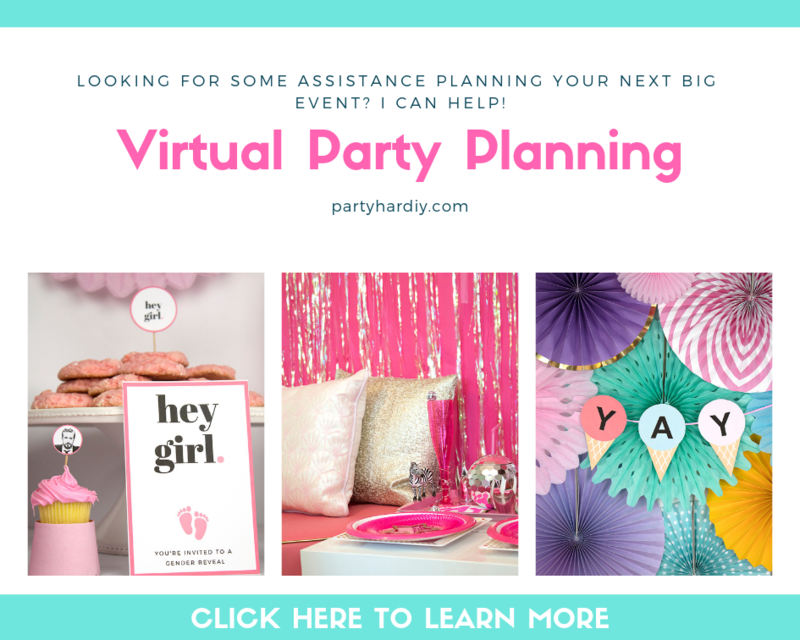 I I covered my cart with sequin table runners and draped my colorful leaf garland on the front for an extra pop of color and to give it a little seasonal fair. 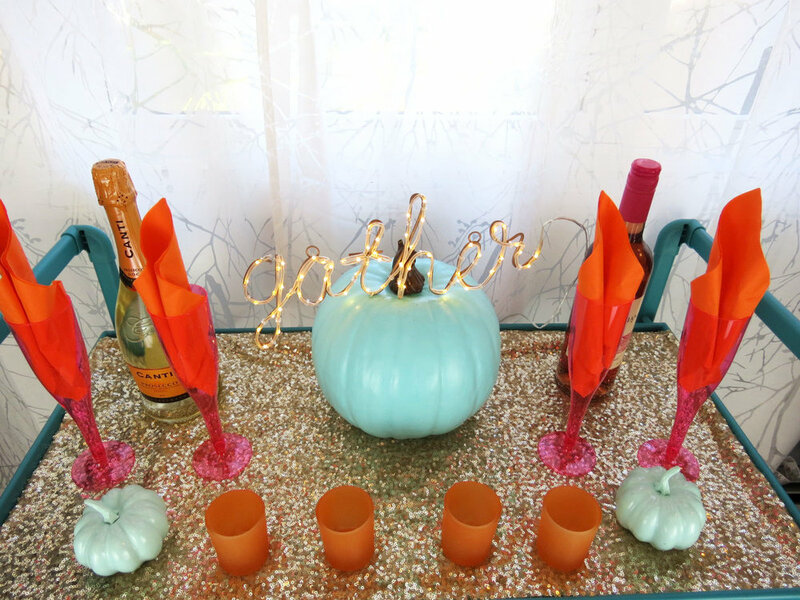 I used my teal pumpkin as the focal point of my bar cart, and placed my cute Gather sign from Target on top. I placed my wine bottles around it, along with some champagne glasses. On the bottom shelf, I put some extra glasses and bottles of wine, but you could also put an ice bucket, your barware, or some extra plates and napkins. And that's all there is to it! Throwing a Friendsgiving party is so fun and rewarding. Seriously, what could be better than an evening wining and dining with your gals?! How do you celebrate Fiendsgiving? Let me know in the comments below!